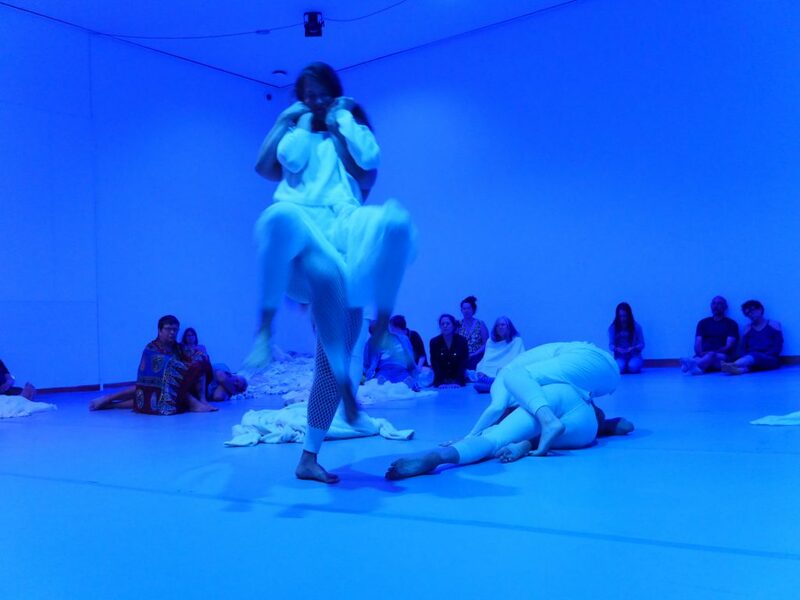 Founded in 1997 in San Francisco, the BodyCartography Project uses dance to explore embodiment and stimulate aliveness. From performances to installations, from films to curatorial projects Olive Bieringa and Otto Ramstand’s work creates a kind of empathetic and kinesthetic engagement in the viewers bodies. 1- In your performances the relationship between you and the viewer is subverted, the traditional active-passive relationship doesn’t exist anymore in your work. Can you describe your relationship with the viewer’s body? How do you interact with them? It’s a big question as we’ve made a lot of different kinds of work over our seventeen year collaboration. Dances for specific communities, specific locations, dances for film, for the theater and for the museum. We are working on a new piece right now that moves from public space into the theater expanding from a one-on-one performance experience into a communal experience in the theater. I think there is a lot of different ways that we do that: one thing we are very interested in is creating a kind of empathetic and kinesthetic engagement in the viewers bodies. Does that mean being close to people? Does that mean leading them into a close up in the film? Does that mean creating a particular kind of environment with an acoustic vibration? Is it about informing their body and their physicality? What they are experiencing is taking them into their own kind of embodied experience. Our newest work is really getting people to enter an environment when they’re right on the edge to decide if they should participate or not participate, there is a lot of room for their engagement in different ways. 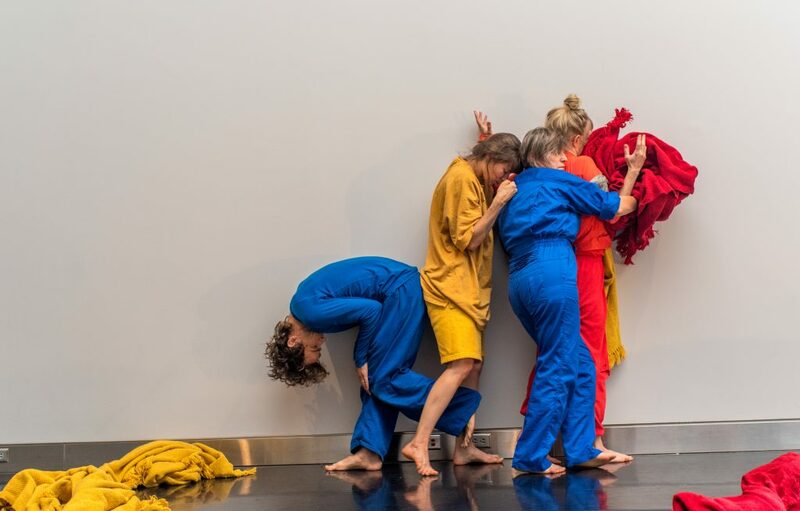 We have an appetite to creating work which create a porous membrane between the audience and performer, activates physicality, invites embodiment and agency, and acknowledges bodies as critical tools. 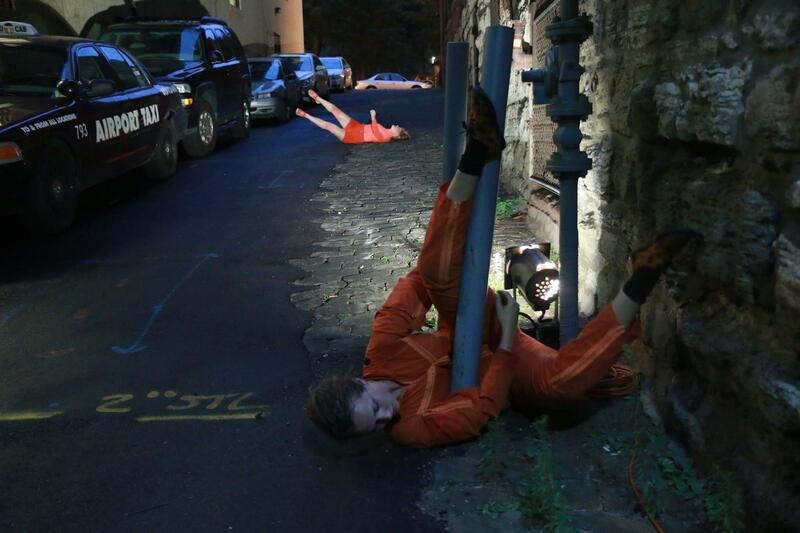 2- Your performances often take place in public spaces, how do you choose the place to perform in? Which characteristics are you searching in the ideal natural stage of your performance? We have worked in a lot of different spaces. Currently we are interested in social landscapes and how they are used by different groups of people. Urban spaces that have a density of people and a diversity of elements or materials ( e.g. water, grass, stairs, ruins, trees) that make up the space that we can engage with physically are very useful. We also love working in the wilderness and in liminal spaces, places where it’s unclear what normal urban behavior might look like, for example a floating break water in a harbor or an abandoned construction site where nature is taking its own kind of control of the space. These places that have been forgotten leave a lot of space for the imagination. 3- How was your artistic interest on the human body born? Which disciplines have inspired you in this research? I have been making things since I was a small child. My parents where both involved in the visual arts. At a certain point I got very interested in the body, movement and performance. Understanding how I could use my body, as my practice and for my art making, seemed essential to anything else I might want to do. It also meant my suitcase was very light as I left New Zealand where i had grown up and began to travel. I pursued dance and ended up studying post-modern and contemporary dance practices in the Netherlands at the European Dance Development Center in Arnhem. Otto, my collaborator and partner, has a deeply shared aesthetic. He studied with similar teachers and also grew up in home with mother who was an artist. We are both certified teachers of of Body-Mind Centering® a somatic movement approach developed by Bonnie Bainbridge Cohen, which informs our artistic practice. Somatic practice is an integrated and embodied approach to movement, the body and consciousness. As dance makers we create a distinct movement language that is behavioral, reflexive, and personal. This practice that enlivens our performers’ and audiences’ physical awareness on a cellular level. It is approach that can be utilized with all kinds of bodies/people and does not require a particular set of movement skills or even a shared aesthetic. What does that mean to move from our nervous system, what does that mean to move from our organs, what does that mean to move from your blood for example? How does each system create a different kind of consciousness, and a different kind of physicality? 4- What is your typical body training? We dance. We dance in the street. We practice Body-Mind Centering®, embodying all our body systems and stages of human development. We practice Authentic Movement, a practice developed by Mary Stark Whitehouse, a therapeutic practice involving being witnessed whilst moving with closed eyes. We’ve worked extensively with contact improvisation, developed by an amazing choreographer Steve Paxton and his materials for the spine. We practice Contemplative Practice developed by choreographer and Buddhist Barbara Dilley. We also worked extensively with Lisa Nelson who is an innovative choreographer, who developed the Tuning Score. We are deeply influenced by other choreographers such as Benoit Lachambre and Meg Stuart and other practices such as Chi Gong, and skateboarding. 5- Do you think it is possible to reach full awareness of our own body? Is it is possible to reach full awareness of our body? Probably not, but it is a valuable practice. We just don’t have the capacity to engage all of our brain cells at one time. We are always only using a small portion of our consciousness. We are living in cultural moment where our cerebral cortex is on overdrive and its so important to find balance for our nervous system and for all of the tissues of body. Fortunately so many of our bodies process are autonomic which is a relief. It would be exhausting to have to remember to take every breath. But what does it mean to open up our consciousness on a cellular level around the whole body? To play with other ways of knowing and being. This is a creative and generative opportunity. Now that is an interesting invitation.